A special rate for Government Employees is also available – learn more and register. Take the NFPA 3000™ (PS), Plan for an Active Shooter/Hostile Event Response Online Training. Learn how to develop an effective and integrated plan. Nationwide and around the globe, communities are facing an increasing number of tragedies involving active shooter and/or hostile events. The need for an integrated preparedness, response, and recovery program is greater than ever before. 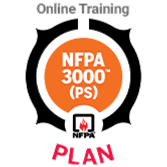 To help you address the need for preparedness within your organization, NFPA® presents NFPA 3000™ (PS), Plan for an Active Shooter/Hostile Event Response Online Training. We work with people every day whose jobs affect the safety of others. Progress at your own pace to gain new knowledge and tools. Along the way, earn the NFPA 3000TM (PS) "Plan" badge. This is the first of three important courses in the NFPA NFPA 3000 (PS), Active Shooter/Hostile Event Response; Plan, Respond, Recover Program Specialist Online Training. Through this two-hour online training, you'll improve your understanding about how to create an effective active shooter/hostile event response plan. Safety planners, first responders, and policy makers such as School Superintendents, Facility Managers, Building Owners, Safety Officers, Security Consultants, Loss Control/Risk Safety Managers, Emergency Services Directors, Human Resources, Fire, EMS, Police, and Federal, State, City and Municipal government officials. Government Employees are eligible for a special rate of $69.99 to attend this training. Eligibility required and you must register at this special rate for Government Employees. Complete this two-hour course and qualify for 0.2 CEUs. Upon successful completion of a course, participants will be prompted to download the CEU certificate and NFPA 3000™ (PS) “Plan” badge directly from the course site. All three courses included in the "NFPA 3000 Specialist Training" (including "Plan for", "Respond to" and "Recover from") are now available. Earn your "Specialist" Badge! Learn more and register for the NFPA 3000 (PS), Active Shooter/Hostile Event Response; Plan, Respond, Recover Program Specialist Online Training.